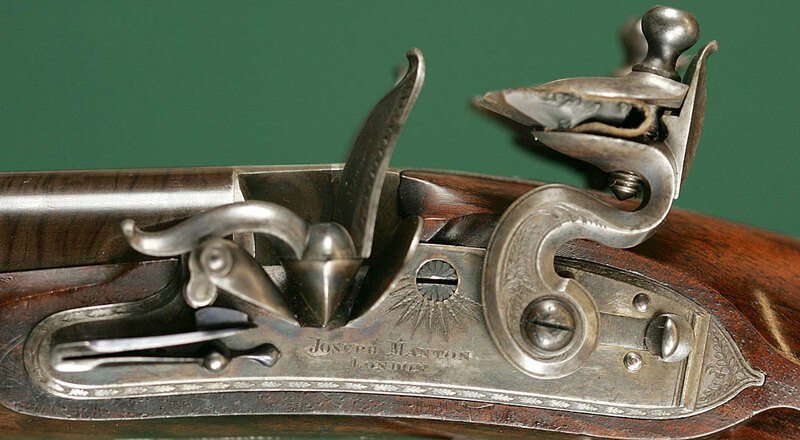 Flintlock - A system of firearms ignition, in general use circa 1660 - 1825, whereby the pull of a trigger releases a sear from a notch in a spring-loaded hammer, which holding a properly knapped piece of flint, strikes a vertical slab of steel (called a frizzen) scraping off tiny molten particles of the steel, and pushing it forward causes an integral flashpan cover to open forward, exposing a bit of fine gunpowder below, which when contacted by the falling sparks, ignites and sends a flash of fire through the touch hole, into the loaded breech setting off the main charge and firing the gun. Flintlock in cocked position, with frizzen rearward and integral flashpan cover closed. Flintlock in fired position, with frizzen and its integral flashpan cover forward and open, the hammer having scraped sparks off its face, dropped them into the now-open flashpan, igniting them and sending fire through the touchole, setting off the main charge within the breech. 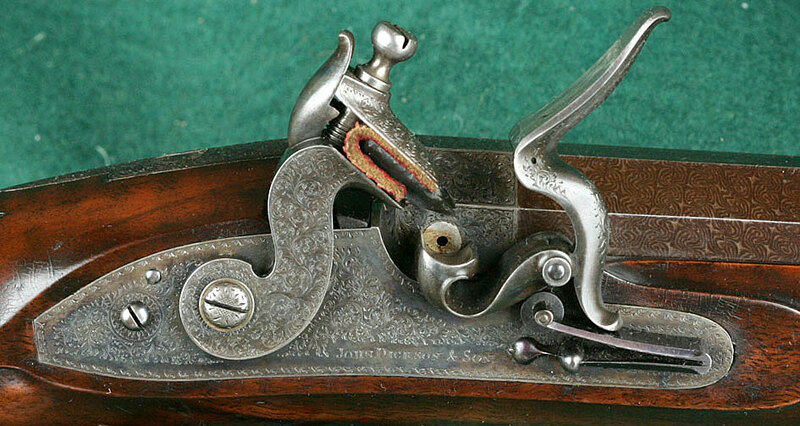 By convention, the precursor of the Flintlock, although operating generally in the same fashion but without the integral flashpan cover, is known as a Snaphance. The Flintlock system was supplanted by the Percussion system.